Hey, you're still awake? Get up sooner or hunter kidnap your mind. 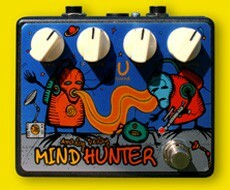 "Mind Hunter" is an analog delay based on four low-noise BBD (Bucket-brigade device) chips V3205D. In the circuit this stompbox is also used compander noise reduction system, in this regard, we have at the output is clean and bright effect. Another feature of this pedal - Headroom increase through voltage doubler. Simply put - if power is 9 volts, you get 18 volts to power the input circuits of the device. Analog Delay pedal is needed in the arsenal of every guitarist - any Digital Delay will not give you such a soft sound as close to analog sound Tape Echo. Are offered three variants with different delay times - 900 ms, 450 ms or 250 ms.